PLANS to run a full electric train service on the flagship Edinburgh to Glasgow line have been delayed again, ScotRail bosses have admitted. The new trains were meant to running by December after the £795 million project was dogged by a series of delays and cost overruns. But now ScotRail boss Alex Hynes has revealed manufacturer Hitachi has said they can’t deliver the 21 trains needed to run a full service by the end of the year. In a letter to Transport Minister Humza Yousaf, obtained by The Sunday Post, the new ScotRail boss insists he is pressing the Japanese firm to deliver but fails to say when the full service will start. 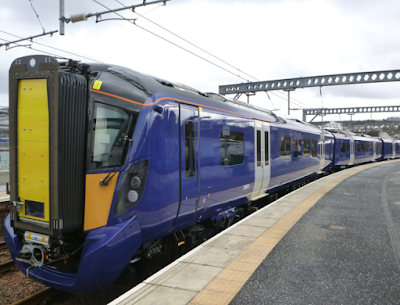 The £370 million fleet of Hitachi Class 385 trains was meant to be up and running a full timetable by autumn this year. This was then put back until December and now it will be 2018 before a full service is introduced. Before the Class 385 trains run, ScotRail plans to operate electric trains borrowed from other lines between Edinburgh and Glasgow. However, this plan has also been delayed at least four times. The introduction of electric trains will not affect the time the journey takes. Network Rail has said journey time improvements will be “incremental” and a report from rail regulators states the 42-minute journey will come some time after March, 2019. Transport Scotland expects the journey time savings to be delivered by December next year. But industry sources earlier this year told The Sunday Post this is unrealistic and December, 2019, is far more likely. In a letter to Mr Yousaf, Mr Hynes said: “A number of issues have been reported by Hitachi and, at this stage, we do not believe we will be in receipt of the 21 trains to run a full electric timetable in December, 2017. Mr Hynes said the first electric trains, borrowed from other routes, will run between Glasgow and Edinburgh in December, not October as previously promised.